Explore the Digital World with Tai, Matt, Sora, Izzy, Mimi, Joe, T.K., Kari and their Digimon in DIGIMON ADVENTURE: VOLUME 2. 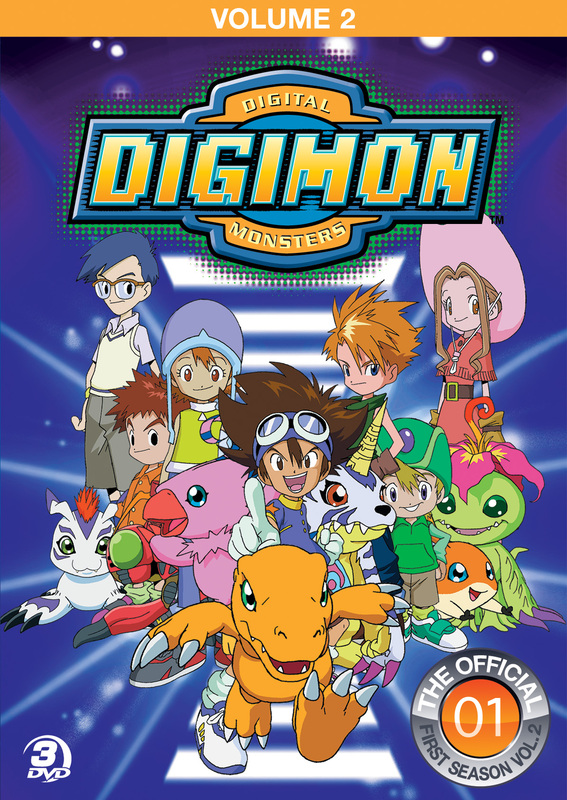 This 3-DVD set includes 18 episodes of the classic DIGIMON ADVENTURE series and follows the group as they learn the identity of the eighth DigiDestined child. By now all the Crests have been gathered, but in VOLUME 2 the kids must defeat Myotismon, a villain who wants to prevent the group from activating their Crests by capturing the eighth DigiDestined child from the Real World. Using a dimensional gate, Myotismon and the kids journey between Worlds attacking and defending as they go. Finally back in the Digital World, Myotismon is defeated and the eighth Digidestined child is revealed. But just as the kids think their job is finished, they look up to see the Digiworld upside down and realize they must fix things in the Digital World before the Real World can return to normal.